There is a serious parking crunch in East San Rafael! Densely populated neighborhoods and increased rates of car ownership over the years have led to serious parking issues in the Canal, Spinnaker, and Baypoint neighborhoods. The Mayor, Council and City have heard the community’s concerns, and the City commissioned a study this year to help identify what measures can be taken to alleviate parking headaches. 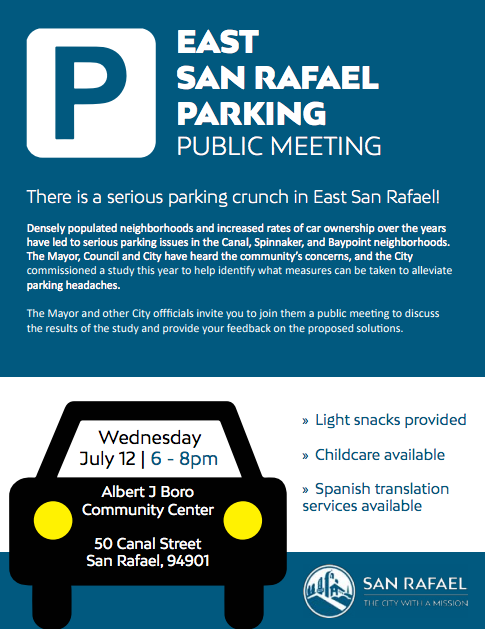 Check out the flyer for more info and check out the Parking Study Report before the meeting!